The Tarotron 3000 is a fortune telling arcade machine. It combines a centuries old divination technique, fine woodworking, pinball machine artwork, and modern technology. Draw four cards from the tarot deck and the robotic mystic will tell you your fortune. The Tarotron 3000 was conceived and designed by Mickey Delp, who also did all of the electronics and programming. The card interpretations were written by Erin Parr. The backboard artwork is by Jesse Philips Art & Design. Woodworking is by Timothy Edward Wiens. 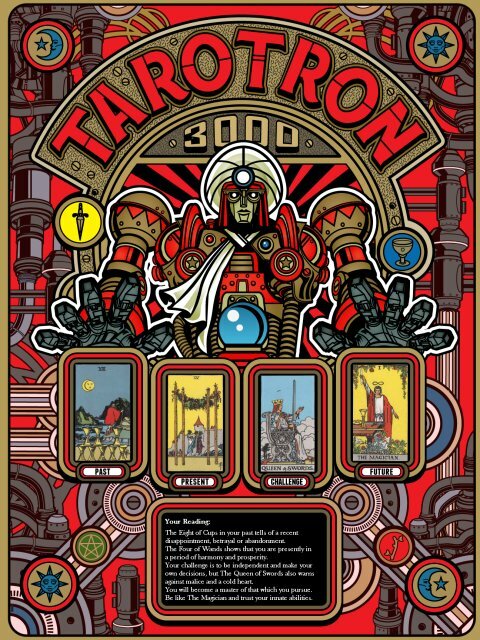 The Tarotron 3000 is the culmination of years of thought and work on tarot machines. It is both the natural progression of, and a leap above the two previous incarnations: The Mystical Tarotron, and The Tarotron 2000.